This month is the deadline for schools to enter students for this summer’s new GCSEs, including maths. They’ll already know which specification they’re teaching, but there is also the choice of which tier to enter students. For those less familiar with the detail of GCSE maths, there are two tiers: foundation and higher. Each tier is targeted at a range of the new numerical grades: 9 to 4 on the higher tier (with a ‘safety net’ grade 3 for students scoring a small number of marks below grade 4), and 5 to 1 on the foundation tier. Students can achieve grades 5 to 3 on both tiers, and the exam papers will include some questions that are the same on both tiers. This will help exam boards ensure that it is no more or less difficult to achieve the same grade on different tiers. The reformed GCSE maths qualifications are different to the old qualifications. They contain new, more demanding content, and have a greater focus on problem solving. So the relative demand of each tier has changed compared to the old qualifications; the bottom grade on the higher tier will be more demanding than in the old specifications, as will the top grade on the foundation tier. We are interested in how schools are making their tier entry decisions in light of these changes. We spoke to teachers in a dozen schools about these changes last year and today we published a report of our findings. Teachers told us that they based their decisions on a range of information, such as a student’s prior attainment and expected achievement, but that they were more hesitant about their tier entry choices this year. This was because there was less information available about the new qualifications, such as past examination papers and grade boundaries. We recently published a blog about the difficulties of predicting grade boundaries ahead of this summer. 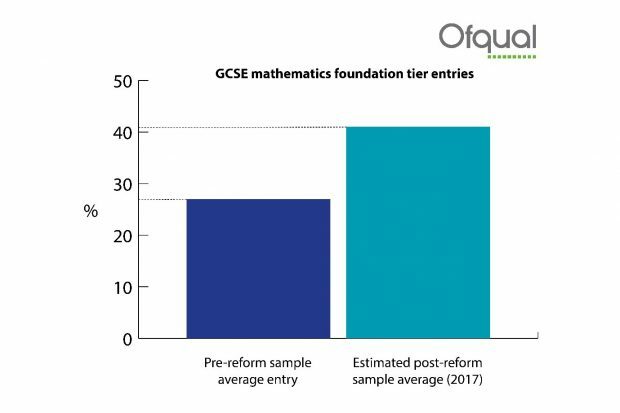 Nearly all schools said they were changing their approach for the reformed qualifications, mainly by entering more students into the foundation tier – see chart below. This was due to the more demanding content, which they felt made the higher tier too much of a stretch for some students who might previously have been entered for it. Our findings are based on a small number of schools, so don’t necessarily represent the views of all schools nationally. However, they provide an indication that schools are actively considering tier entries in light of the changes to the qualifications, which seems sensible. We cannot tell you the ‘right’ entry strategy for your students, but we hope this analysis is helpful as you finalise your thinking. Can you clarify something for me, I was sure the Maths grades were Higher 9 to 4 with 3 for students just below 4 and Foundation 6 to 1 not 5 to 1 as you state. My daughter is in the foundation maths, she wants a levels. I assume that she will never get a high enough grade in maths to do A levels? Can she retake maths next year at the higher level? Due to the changes and not enough material for teachers to use with students the Foundation tier is the safety net. Lack of model questions and grade boundaries has left many teachers stuck. Risking students into higher tier is suicidal. I suggest you speak to your daughter's school, as you can, about her tier of entry. Exam boards will usually accept tier changes without charge, up until about 21 April. On the higher tier, grade 4 is the lowest grade that the qualification is aimed at, but there is a small 'safety net' narrow grade 3 available. However, there is a risk that if she does not achieve enough marks for a 4 (or an allowed grade 3) that she will receive an ungraded result. My daughter and several other students were pulled from the higher tier maths exam yesterday and told they are doing the foundation. This caused great distress as many need a score of 6 to secure college places. They have worked for 2 years on her tier work will the foundation be much different and should they have been told sooner than the day before. A grade 3 is equivalent to the old D grade. This means she has not achieved a 'standard pass' which is grade 4 and above. She will also have to continue with her study of maths in post 16 education until she achieves a grade 4 or better. The Edexcel boundaries were 12% for a grade 3 and 18% for a grade 4. This means your daughter will have scored between these two boundaries. I would imagine that it was a highly demoralising experience to sit through 4 and a half hours of exams which were largely inaccessible. The grade boundary for a grade 4 on the foundation paper was 50% which suggests it would be a much more suitable tier for your daughter. If she resits I would strongly suggest she does the foundation tier. As a general rule I would suggest the higher tier is a good option for students who are realistically aiming for a grade 6 or above. Unfortunately the 2017 cohort has been hugely let down by Ofqual and the examination boards who have given insufficient advice to schools. I have just found out about the tiering process. I am absolutely horrified by this process. Young people are having their futures decided for them by others at an early age. This reminds me of CSE's and O'levels, where different curriculums were taught to different levels making harder for people selected for CSE to prove themselves. Talking as some one who out performed school predictions, by a long way, I had the opportunity to do O' levels but what if I had only be allowed to do CSE's; I would never have had the career or academic success that I have enjoyed. If others are forced to predict and forced to put them in a boxes surely we are curtailing their potential and robbing them of the opportunity to prove themselves, If it is a C so be it, but it could be a B. Lets risk it for the kids. Every one needs to be taught the full curriculum and have the opportunity to prove themselves. There is nothing wrong with being all the you can be and taking a punt on yourself. When you talk of 'accessing' maths and being able to 'prove' themselves by scoring points at a lower level is patronising, because essentially the system has taken away this opportunity before they have even tried, don't take away the away the real opportunity to compete. I have just found out that my daughter has put into foundation. I have just learnt that at best she can hope for a C, I am not saying that she is A in this subject, as it is a weaker subject but I definitely thought with the right support she is capable of a 'B'. She is very good at science does this mean that her options will be curtailed because the best she can hope for is a C in maths. Under the old system she may only get a C but she has competed with others and had the opportunity 'to throw her hat in the ring' with others without prejudice. In fact will this effect her future with universities. She is very interested in politics, does this mean she will not be able to do Economics because she needs a B in maths. Please do not put in place educational systems which introduce limitations at early stage in life. There are many factors which effect performance including the idea that girls are not as good as boys at Maths. Girls get plenty of messages that they are not as good as boys at this subject (reference to Cordelia Fines work) Please give opportunities for creativity and joy in education, not live long regrets and 'what ifs' otherwise we are failing our children. Helen I have just found out the exact same for my Son. Its quite scary but do I insist he goes up a set in Maths and tries he's best. I have heard that the best result for the foundation level is a "C". He needs at least a "B" to get into sixth form at he's school. (he is in a gramma school). How rubbish to know that for the next 2 years no matter what happens he will not be able to reach the required standard . In the new maths GCSEs, which are graded 9 to 1, the highest grade available on the foundation tier is a 5, which is broadly in line with a low B on the old qualifications. I suggest checking with your son's school what their requirements are in terms of the new 9 to 1 grades. Agree, can't see why there can't be more of an overlap on the foundation / higher papers i.e foundation 1-6 and higher 4-9 to allow those who are capable, but only really apply themselves when the exams approach, get above a 'C'. One girl at my daughter's school entered for higher elsewhere as she was labelled 'foundation' and told she would end up with nothing if she took the higher paper: she got grade 6. The system is broken because everybody should do the same paper.Like English where one tier will equal grades 9-1,this gives everybody an equal chance of doing A-level maths.grade 1 questions at the beginning of the paper and grade 9 in the end. JJ Absolutely agree! Just what has been happening since time immemorial. Interesting to note there is not one blog in support of the new system. Do the students have legal rights to choose which tier they sit? We have checked this with the Department for Education. There is nothing in law on this point. Therefore it is for the school to decide the appropriate tier of entry for a student. DfE expect the school to do this in consultation with the student. If the student is unhappy with the decision made by the school, then they should follow this up via the internal school complaints procedure. 9/8 is an A+/A, 7/6 is a B+/B, 5/4 is a C+/C. As you can see in this picture showing the new and old grades, the top of grade 5 is broadly in line with the bottom of a grade B in the old system. Previously B was not available on the higher tier. Also, on foundation tier, previously the D and safety net grade E are broadly in line with grade 3 and the top of grade 2, whereas the 9 to 1 foundation tier only includes a narrow grade 3 as a safety net. Those differences are why we say that the overlap grades are slightly higher. It's a relatively small difference but an important one for students at those overlapping grades.